The full automatic bag-given packing machine is designed to meet the large enterprises, small and medium-sized enterprises to realize the automatic packaging instead of manual packaging. The operator only needs to place the hundreds of bags in the bag taking device one time, this packing machine can complete the whole packing process automatically, improving the production efficiency and greatly reducing the cost. 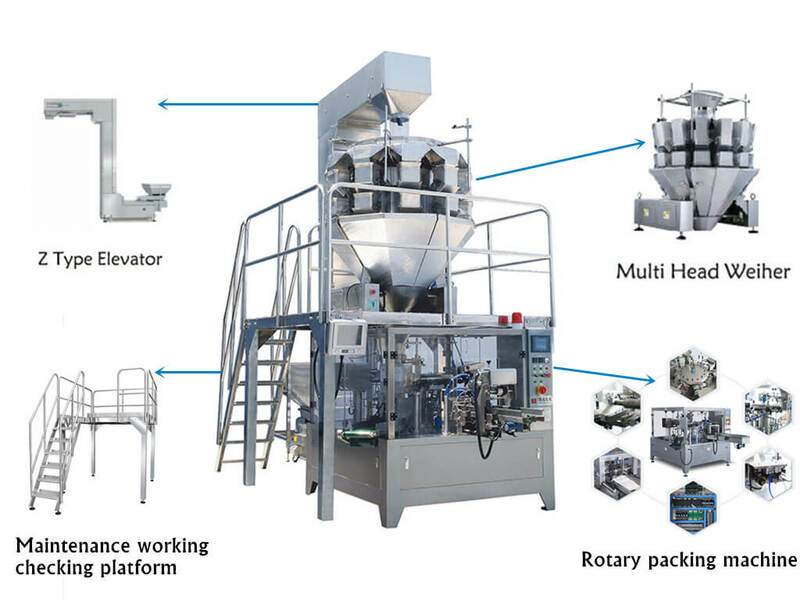 It is a multi-purpose packing machine, equipped with different counting device can pack kinds of product such as powder, liquid, granule, etc. 1. Adopt advanced PLC from Germany Siemens, mate with touch and man-machine interface control system, easy to operate. 2. Material or packaging bag contact parts adopt stainless steel or other material which accord with the food hygiene requirements, health, and safety. 3. The full automatic bag-given packing machine uses a frequency conversion device, can optionally adjust speed in the specified range. 4. 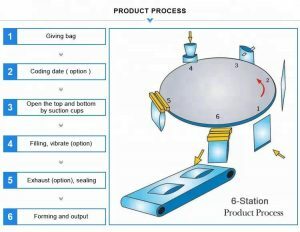 Automatic detection function, if the bag is not open or the bag opening is not complete, it will not feed and heating sealing, the bag can be used again, no waste of material and save the cost of production. 5. Safety device, when the working pressure is not normal or heating pipe fault, it will alarm. 6. The width of the bag is adjusted by the electric motor, convenient operation and time-saving. 7. Employ imported engineering plastic bearing and oil-less vacuum pump to reduce pollution to material and environment. 8. Using a preformed bag, perfect packing bag pattern, good sealing quality, low package material loss, improve the grade of the product. 9. The random distribution of organic glass safety door, to protect the operator. 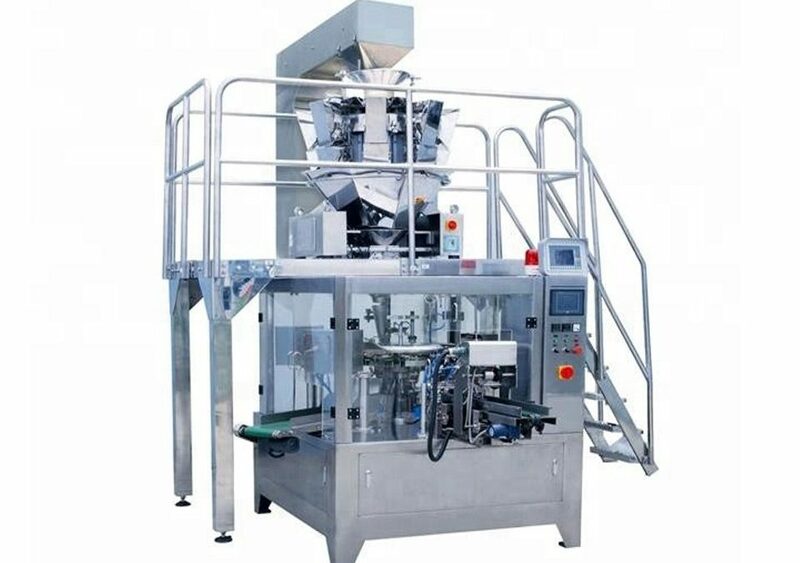 The full automatic bag-given packaging machine has widely packaging range, with different feeders, it can be applied to pack the liquid, paste, powder, granules, irregular lump material, etc. 1. Lumps: candy, chocolate, biscuit, peanut, beans, nuts, puffed food, cakes, etc. 2. Granules: granular drug, capsule, seed, sugar, the essence of chicken, pesticide, fertilizer, feed, etc. 3. Powder: spices, milk powder, glucose, washing powder, chemical raw material, refined sugar, etc. 4. Liquid/paste: detergent, yellow wine, soy sauce, vinegar, fruit juice, tomato sauce, peanut butter, jam, chili sauce, bean paste, etc.